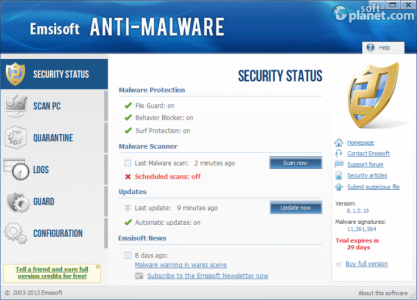 SoftPlanet makes it possible for everyone to get free Emsisoft Anti-Malware download directly from our servers. There is no registration needed for downloading. Emsisoft Anti-Malware 9.0.0.4157 is one of the programs that starts to work for your protection right after you start it. For this reason it downloads the updates right away and then it offers you to scan the content of your computer for Viruses, Trojans, Rootkits, Worms, Bots and Spyware. For this function the application offers three types of scan and also one custom. 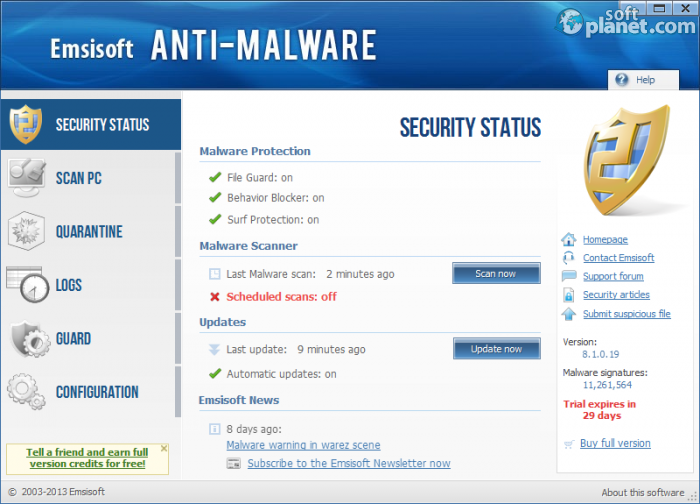 After it finishes with the scan you can start the Anti-Malware guard that will run with the startup of your PC. When you finish with the setup process the app will hide itself in the taskbar so it will not bother you if there's no reason. When the program starts for the first time the scans that it offers you are Quick, Smart, Custom and Deep. Each one of them has its advantages, but you have to keep in mind that developer Emsisoft brags that its software is the fastest there is, even though it uses a dual scanner. It has some other capabilities like Quarantine and Anti-Malware guard that are also quite useful. Emsisoft Anti-Malware has a tabbed interface so you can use the app without too much effort. From the tab Security status you can view information about your malware protection and also the time the scan was last performed and the updates. From Scan PC you activate the various scanning methods and from Quarantine you can view the files that were selected for storing or permanent deletion. From Logs you can view additional info about the history of usage of this app while from the Guard tab you can set different options. A good side of the interface of the app is that it can be used in a lot of languages. Most of the configuration utilities in Emsisoft Anti-Malware 9.0.0.4157 can be found in the tab with the expected name. Besides the change of language there you can set Scheduled Scans, adjust the automatic updates or the update settings. You can also view notifications, logging, permissions and also license settings. This makes the program very customizable, which is useful mainly for advanced users. Emsisoft Anti-Malware is not only customizable but also multilingual and very capable. It can scan your computer in a very fast manner, but like all capable apps it also costs some money after the 30-day trial period. If you like the app you can buy one license for one year with a payment of EUR 19.98. Our security scan shows that Emsisoft Anti-Malware is clean from viruses. The current version of Emsisoft Anti-Malware has been scanned by our system, which contains 46 different anti-virus algorithms. That ensures that Emsisoft Anti-Malware 9.0.0.4157 is 100% safe for your computer.